We are so excited to share that State College Area Meals on Wheels has been selected to be a part of the GIANT Bags 4 My Cause Program, which is designed to make it easy for customers to contribute to their local community while supporting the environment. 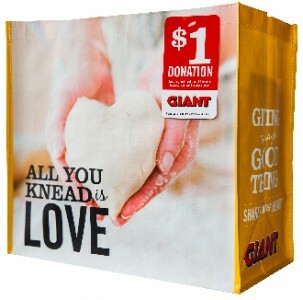 For the month of April 2019, each time a reusable Bags 4 My Cause Bag is purchased at the GIANT located at 255 Northland Center or at 2222 E. College Avenue, both in State College, $1 will be donated to State College Meals on Wheels, unless otherwise directed by the customer through the Giving Tag. This is a great way to raise awareness, support the environment and raise funds for meals that are delivered to individuals who are homebound, disabled, or recovering from a health issue or procedure. Let’s get started! The more people who learn about the program and purchase the Bags 4 My Cause Bag during the month of April, the more we can serve others who need healthy and affordable meals. To learn more about this program, please visit giant.bags4mycause.com. Thank you for your support! And thank you to Giant for selecting MOW for this wonderful program!